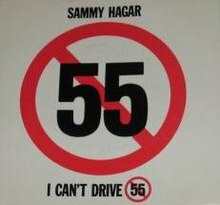 "I Can't Drive 55" is the lead single and first track from Sammy Hagar's eighth studio album VOA in 1984. Perpetuated by a very successful music video, it became a concert staple that continued throughout Hagar's tours as a member of Van Halen. The song is a reference to the since-repealed National Maximum Speed Law in the United States, that originally set speed limits at 55 miles per hour (89 km/h). It is the 100th song on VH1's 100 Greatest Hard Rock Songs. I was in a rent-a-car that wouldn't go much faster than 55 miles an hour. I was on my way back from Africa. I did a safari for three months throughout Africa. A really great vacation after Three Lock Box. I was traveling for 24 hours, I got to New York City, changed planes, Albany, New York. Got in a rent-a-car. Had a place in Lake Placid at the time, a little log cabin, I used to go there and write with my little boy. Aaron, at that time, went to North Country school when I was on tour. I would go there and see him. It was a really cool getaway. But it took two and a half hours to drive there from Albany. And I was driving from Albany, New York at 2:00 in the morning, burnt from all the travel. Cop stopped me for doing 62 on a four lane road when there was no one else in sight. Then the guy gave me a ticket. I was doing 62. And he said, 'We give tickets around here for over-60.' and I said, 'I can't drive 55.' I grabbed a paper and a pen, and I swear the guy was writing the ticket and I was writing the lyrics. I got to Lake Placid, I had a guitar set-up there. And I wrote that song there on the spot. Burnt. The song's music video was directed by Gil Bettman. The video was shot on location at the Saugus Speedway in Santa Clarita, California. The song's video includes Hagar and his band being chased and jailed by the California Highway Patrol for traffic violations. The video shows Hagar driving a black Ferrari BB512i which is later tuned up by Hagar's mechanic, Claudio Zampolli. Zampolli was driving the Ferrari during the video's opening shot, where the Ferrari fish-tails across the speedway. Hagar claims in the commentary for the video on the DVD, The Long Road to Cabo that he burned out his clutch during the video. Hagar drove a 512, but a 308 was also used. Hagar claims it cost him $5800 to fix. A trial scene is presided over by a judge played in a cameo appearance by John Kalodner. The judge's props were borrowed from director Robert Zemeckis, who had filmed the movie, Used Cars. Sets were built and the video was shot during the summer. There was no air conditioning in the jailhouse set, so the cast and crew were hot. The yellow jumpsuit, worn by Hagar in the video, can be seen at the New Orleans Hard Rock Cafe. A stuntman was used for Hagar's stunts. An exploding ramp was used to throw Hagar across the courtroom. The song has been a signature track for Hagar during and after his tenure with Van Halen, and is commonly used on TV programs and commercials related to automotive racing. Most recently, the song was featured in a NAPA Auto Parts commercial, where NASCAR drivers Michael Waltrip and teammate Dale Jarrett are asking Hagar to keep the noise down during a recording session; in response, Hagar asked Waltrip if he could drive faster. Waltrip's car number at the time of the 2007 commercial was No. 55 and he had failed to qualify for some races. In 2001, NBC Sports had Hagar record a "corrected" version, now known as "I Can't Drive 65," reflecting the common (at the time) 65 miles per hour (105 km/h) speed limit on freeways (made six years after the National Maximum Speed Law was repealed), for use during Budweiser Pole Award presentations on Winston Cup Series broadcasts on NBC and TNT. It was used from 2001 to 2003 during the broadcasts. The accelerated version of the song was also available as a download for NHL Rivals 2004. In 2011, the song became the opening theme for ESPN's NASCAR coverage for the 2011 season. The song is featured as a playable track in Guitar Hero On Tour: Decades and Guitar Hero Live. "I Can't Drive 55" was an achievement and Easter egg found in Forza Motorsport 4 for owning a Ferrari GTO, the car used in the music video. The song is on the soundtracks of NBA 2K18 and Twisted Metal. The song is used in the 2018 film, Bumblebee. The song is played when Niklas Kronwall of the Detroit Red Wings and Noah Hanifin of the Calgary Flames score goals at home. ^ "Sammy Hagar - "I can't drive 55"". mvdbase.com. Retrieved 2012-06-29. ^ IMDB. "Back to the Future Part II (1989)". IMDB.com. Retrieved 26 May 2016. ^ "Moving Violations (1985) - Soundtracks - IMDb". "Your Love Is Driving Me Crazy"
This page was last edited on 20 February 2019, at 03:28 (UTC).